New nestcams to watch and keep up-to-date with the birds you love! In addition to nests with eggs and chicks, last year’s Manikan-cam is back and highly recommended if you want to see some fancy mating dances. Bald Eagles in Decorah, Iowa have 3 eggs. 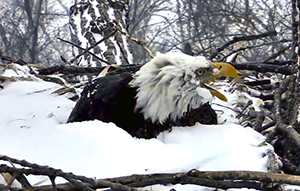 It’s still winter in Iowa and these Bald Eagles are sometimes covered in snow while keeping their eggs warm. Several Laysan Albatross families with growing chicks at this nestcam in Hawaii. The Lance-tailed Manakins in Panama are doing their mating dances on and off during the day. If they aren’t around, you may hear Howler Monkeys! Bald eagles in Channel Islands, CA now have a couple of chicks! Bella Hummingbird nest – If you follow this popular hummingbird nest, sadly this year has not gone well. The female was spending too much time defending the nest and was unable to keep the chicks warm. One, named Comet, did not make it, and the other, Star, has been taken to a rehabber for care. Here’s a nice Tribute to Comet.